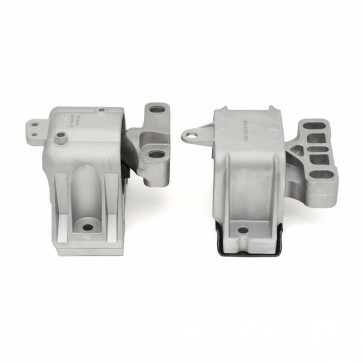 The Street Density Engine Mount Pair is manufactured from 50 durometer rubber, which is approximately 25% stiffer than stock. Since the mounts are also void-free and solid-filled, the resulting mount is approximately 60% stiffer than stock. The cast aluminum mount bodies have also been redesigned to cope with the added stress of spirited driving. The Track Density Engine Mount Pair is manufactured from 80 durometer rubber, which is approximately 90% stiffer than stock. Since the mounts are also void-free and solid-filled, the resulting mount is approximately 120% stiffer than stock. The cast aluminum mount bodies have also been redesigned to cope with the added stress of spirited driving. The result is a locked-down drivetrain, solid shifting, and virtually no wheel hop. Track Density Mounts will cause a noticeable increase in noise, vibration, and harshness (NVH) inside of the cabin. These mounts are a completely re-engineered performance solution, not just inserts for use with the factory mounts. We recommend Street Density Mounts for all daily-driven vehicles. They offer a significant increase in performance with a minimal increase in NVH transfer into the cabin. Track Density Mounts are recommended for purpose-built track cars, or those who do not mind significantly increased engine noise and vibration in the cabin. Please select Street Density or Track Density from the dropdown menu below.